Cisco ASR 1000 Series Aggregation Services Routers aggregate multiple WAN connections and network services, including encryption and traffic management, and forward them across WAN connections at line speeds from 2.5 to 200 Gbps. The routers contain both hardware and software redundancy in an industry-leading high-availability design. The latest addition to the Cisco ASR Family is the Cisco ASR 1001-X Router, a single-rack-unit (RU) router supporting 2.5- to 20-Gbps forwarding capacity. Cisco ASR 1001-X Router speeds can be “turned up” incrementally to as much as 20 Gbps with a simple throughput upgrade license, rather than having to purchase additional hardware blades or new routers. The Cisco ASR 1000 Series supports Cisco IOS XE Software, a modular operating system with modular packaging, feature velocity, and powerful resiliency. The Cisco ASR 1000 Series Embedded Services Processors (ESPs), which are based on Cisco QuantumFlow Processor technology, accelerate many advanced features such as crypto-based access security; Network Address Translation (NAT), thread defense with Cisco Zone-Based Firewall (ZBFW), deep packet inspection (DPI), Cisco Unified Border Element (CUBE), and a diverse set of data center interconnect (DCI) features. These services are implemented in Cisco IOS XE Software without the need for additional hardware support. The Cisco ASR 1000 Series Routers carry a modular yet integrated design, so network operators can increase their network capacity and services without a hardware upgrade. With flexibility in the number of connections, speed maximums, and price, you don’t have to under-provision or overprovision for any network location. Alternatively, you also have the option to buy an “-X” model, so you can increase throughput by simply purchasing upgrade licenses as you grow to increase your network speed dynamically. Table summarizes the features and benefits of the Cisco ASR 1000 Series Routers. Provides system and business continuity. Redundant Route Processors and Embedded Services Processors in ASR 1006 and ASR 1013. Redundant instances of Cisco IOS XE Software in ASR 1001, ASR 1001-X, ASR 1002, ASR 1002-X, and ASR1004. Redundant hardware combined with modular software contains faults preventing systemwide failure. Enables redundancy across routers by using a pair of routers to act as backup for each other. Provides 99.999% (“five-nines”) availability for consistent, high-performance user application experiences. In-Service Software Upgrade (ISSU) support No need to schedule downtime windows; changes are made while the system keeps on working, with nonstop routing availability. Cisco IOS XE Software Sub-package Mode Ability to upgrade individual software components with reduced upgrade time. Software modularity Allows you to mix and match the services that best meet your business needs; no “wasted” investments on capabilities you don’t need. Pay-as-you-grow licensing with “-X” models When you need greater throughput, you simply activate it with a change in software license, rather than having to expend capital for additional hardware. Cisco Shared Port Adapters (SPAs) Allow you to reuse your investment in network I/O across platforms. Cisco Network Interface Modules (NIMs) Allow you to reuse your investment in network I/O across platforms. Cisco creates a new paradigm for the WAN edge with the Cisco ASR 1000 Series Aggregation Services Routers, which offer business-critical resiliency with intelligent services flexibility to allow enterprise businesses to accelerate their growth potential. What Is the Cisco ASR 1000 Series Router? 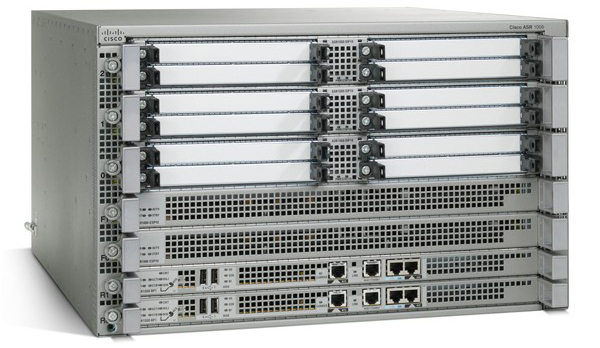 The Cisco ASR 1000 Series Router, a critical part of the Cisco Borderless Network Architecture, is the industry's first aggregation services router and the first system within the Cisco portfolio to use the Cisco QuantumFlow Processor, a processor built for edge-based service delivery (refer to Figure 1). You can deploy the Cisco ASR 1000 Series Routers at the enterprise to provide secure WAN aggregation services; integrated threat and defense services at the WAN or Internet edge; data center interconnect (DCI) router; managed customer premises-equipment (CPE) services; or to deliver complex residential quadruple-play (data, voice, video, and mobile) or business services from the provider edge. Meeting the requirements of the aggregation service edge required an entirely new category of network processors. Cisco has developed an innovative router engine called the Cisco QuantumFlow Processor, which is the industry's first fully integrated and programmable flow processor. The Cisco QuantumFlow Processor combines massive parallel processing, customized quality of service (QoS), advanced memory management, and integrated services programmability. With these capabilities, the Cisco ASR 1000 Series accelerates service deployment and feature velocity, resulting in reduced qualification and deployment time and lower operating expenses (OpEx). WAN edge infrastructure performance: Enterprises need to deliver higher-performance, higher-bandwidth services over their converged WANs, along with capacity headroom to operate efficiently. Highly available WAN infrastructure: Enterprises need to provide anytime, everywhere access to applications and services over the WAN. This provision requires a more highly available, resilient, and adaptive infrastructure than they have today. WAN security for data protection and compliance: Businesses need to satisfy industry regulations regarding data privacy, and adhere to regulations such as the Sarbanes-Oxley Act (SOX), Payment Card Industry (PCI), Health Insurance Portability and Accountability Act (HIPAA), and so on. Service delivery with application intelligence: Enterprises need to meet demanding internal service-level agreements (SLAs), with improved service delivery and application performance over the WAN. The Cisco ASR 1000 Series provides scalable, secure multiservice aggregation at the headquarters, and high-end branch-office and managed CPE services in remote offices. By meeting or exceeding these requirements, the Cisco ASR 1000 Series Routers are helping to define the new enterprise WAN. Chassis: The chassis is available in five different form factors, and all have capability for dual power supplies. Route processor: The route processor runs the router control plane, including processing of network control packets, computation of routes, and connection setup. Embedded services processor (ESP): The ESP includes the Cisco Quantum Flow Processor chip set and provides forwarding, services, and traffic management (QoS) capabilities. A redundant ESP module option is available for the 6RU and 13RU chassis. SPA interface processor (SIP): The SIP is the housing for the shared port adapters (SPAs) in the system, each of which can take up to 4 half-height SPAs, or 2 double-height SPAs, or 1 double-height SPA and 2 single-height SPAs. Guarantee high-priority applications by creating a virtual “glass ceiling” for lower-priority applications. Improve user experiences. Example: An explicit policy allowing HTTP and Domain Name System (DNS) to traverse the Internet-DMZ zone boundary would be required. This implementation of branch-office architecture offers powerful investment protection with services and scale. Managed CPE helps branch offices route correctly over various types of Ethernet to comply with service-level agreements (SLAs). This application encrypts multiple gigabits of bandwidth without any additional service blades or modules. Managed CPE optimizes the WAN to routearound brownouts in the service provider network to further guarantee mission-critical applications. This application offers small form factors (1rack unit [1RU] for the Cisco ASR 1001 and 2RUs for the Cisco ASR 1002 Fixed, ASR 1002, and ASR 1002-X Routers), including software modularity and ISSU. Note: ISSU is not supported on Cisco ASR 1001, ASR 1002-F, ASR 1002, ASR 1002-X, or ASR 1004. Managed CPE offers accessibility even when the Cisco IOS Software is down. Offers first-in-industry software redundancy support, without any additional hardware module, on Cisco ASR 1001, ASR 1001-X, ASR 1002, ASR 1002-X, and ASR 1004; hardware redundancy and ISSU are supported on Cisco ASR 1006 and ASR 1013. Offers powerful firewall and NAT performance of 2.5 to 200 Gbps and 1.8- to 78-Gbps encryption support in addition to WAN optimization and voice features. The solution offers Layer 2 Tunneling Protocol (L2TP) endpoint-to-tunnel Point-to-Point Protocol (PPPoX) or IP sessions with bandwidth demands in the STM-1 ATM, Fast Ethernet, Gigabit Ethernet, and 10Gigabit Ethernet range. The application is ideal for triple-play (data, voice, and video) wholesale deployments. It offers integral service delivery. Per-user firewall, SBC, etc. are supported. The application provides integral services in the Cisco QuantumFlow Processor. It provides encryption, FPM, NBAR, SBC, IP Multicast, etc. The application provides high scalability. It offers a modular design of the route processor and embedded services processor with hardware and software redundancy. Note: The Cisco ASR 1001, ASR 1002, and ASR 1002-X Routers ship by default with 4-GB DRAM. 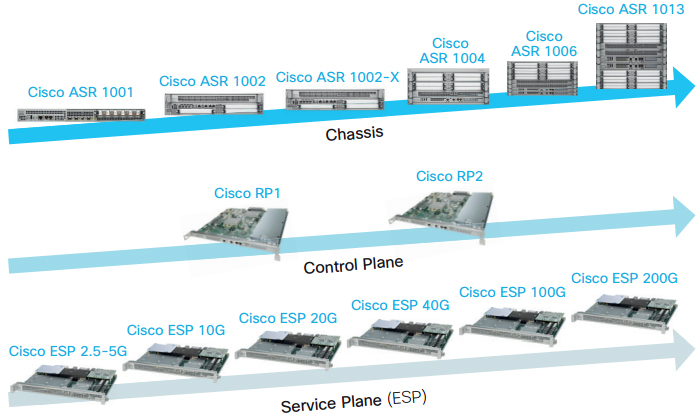 The Cisco ASR 1001 and ASR 1002-X are upgradable to 8- or 16-GB DRAM. The SBC application (named Cisco Unified Border Element [ENTERPRISE Edition]) performs the voice and video gateway functions simultaneously with regular IP data services. No appliance or additional service blade is required. The control protocols and media protocols work transparently within a complex voice architecture. Enables secure and authenticated SIP trunk connections to service provider real time voice and video services. The WAN edge is simpler to manage because only one egress and one ingress point for internet or service provider services access. The control plane is separated from the data-forwarding plane, so the signaling and control processes are separate from media processing. The CUBE SBC application can be used for SIP trunk video and/or audio services provided by service providers or for Internet accessible SIP line-side services to Cisco Unified Communications Manager. * Depth applies to chassis edge-to-edge dimension and does not include protrusions such as card handles, power supply handles and cable management brackets. Refer to applicable hardware installation guide for additional detail. 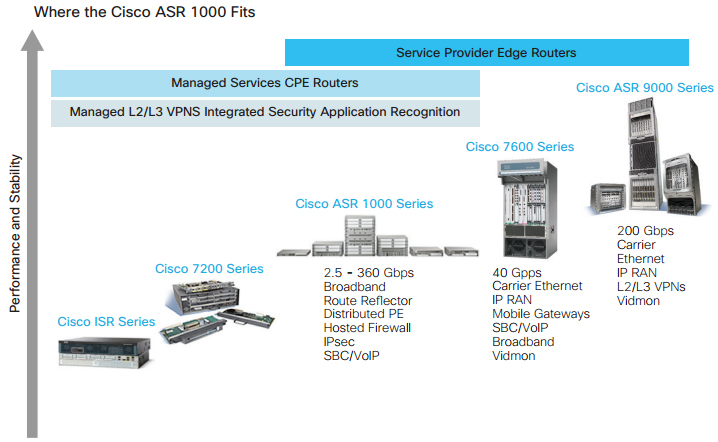 Download the Cisco ASR 1000 Series Aggregation Services Routers Datasheet (PDF).